In 1928 Donald Eugene Gibson was born in Shelby, North Carolina. His family was poor and he stopped attending school in grade two to help out his sharecropping parents. He developed an interest in music at an early age and was inspired by recording artists like Tennessee Ernie Ford. Don Gibson began performing at local clubs before he was 18. In his late teens he held down a number of jobs including a as soda jerk, baby diaper deliveryman and dishwasher. A friend came home from Paris, France, after World War II with records by the jazz guitarist Django Reinhardt. This enhanced Gibson who began to experiment with different styles by his mid-teens. In 1946, he became a regular with the Tennessee Barn Dance in Knoxville, but things weren’t what Gibson expected. The fans wanted old-time country, not Gibson’s brand of crooning. He hung on to the radio job but struggled on $30 a week earned playing beer joints. After World War II he formed a band called the Sons of the Soil who, in 1949, appeared live on a local radio station, WHOS. With some early success, he recorded some records for Mercury Records and later with Columbia. Next he relocated to Knoxville, Tennessee, and played on the WNOX Midday Merry-Go-Round and Barn Dance series there. In 1950, he assumed control of the band, renaming them Don Gibson & His King Cotton Kinfolks and switching their musical direction to honky-tonk. Although their sound was more focused, they remained unsuccessful. Gibson continued to perform on the radio, as well as at Esslinger’s Club in Tennessee. Wesley Rose of Acuff-Rose signed him to a writing contract after seeing Gibson perform in a Knoxville club. Rose then moved his protégé over to MGM, and in 1956 Don Gibson scored his first hit with “Sweet Dreams,” which climbed to #9 on the Billboard Country charts that year. But success was elusive for Don Gibson. Cover versions of “Sweet Dreams” by Faron Young and Kitty Wells cover of a song Gibson wrote in 1956 called “I Can’t Stop Loving You,” set Gibson on a trajectory to getting a record contract with RCA in 1957. At RCA it was Chet Atkins who began to produce all of Don Gibson’s records through ’til 1964. In 1958 Atkins produced Don Gibson’s follow-up single to “Sweet Dreams” which was titled “Oh Lonesome Me,” with “I Can’t Stop Loving You” on the B-side. The single became a double-sided hit on the country charts and then crossed over with respectable success on the Billboard pop charts. The A-side made it to #7 on the Billboard pop charts, but only to #37 in Vancouver. “Oh Lonesome Me” became a template for the “sound” Don Gibson that radio listeners would identify with. Other hits that followed included “Blue Blue Day” which became a #1 country hit in 1958. 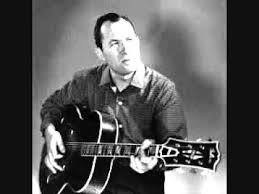 Gibson’s fifth Top Ten country tune in 1958, “Look Who’s Blue”, climbed into the Top Ten in Vancouver, peaking at #8. 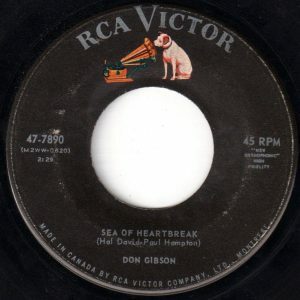 After “Look Who’s Blue,” Don Gibson had more hits on the Billboard country charts with “Don’t Tell Me Your Troubles” (1959), “Sea Of Heartbreak” (1961), “Lonesome No. 1,” “I Can Mend Your Broken Heart” (1962), and “Woman (Sensuous Woman),” a number one country hit in 1972. Some of these crossed over into the Billboard Hot 100 and charted on AM pop radio. “Sea Of Heartbreak” climbed to #21 on the Hot 100. “Sea Of Heartbreak” was co-written by Paul Hampton and Hal David. Hampton was born in 1937 in Oklahoma City. In 1960, he recorded a song titled “Two Hour Honeymoon”, co-written with Burt Bacharach. The tune was a teen tragedy genre with spoken word. The narrator concedes “we were driving too fast.” Between 1957 and 1967, Hampton released thirteen singles variously on Dot, Cameo, WB, Decca, A&M and Battle. But none of his recordings were commercially successful. As a songwriter and composer Hampton had more success. He wrote “Donna Means Heartbreak” for Gene Pitney and “You Don’t Know What You’ve Got (Until You Lose It)” for Ral Donner. Various recording artists took Hampton’s songs into the recording studio. These include Rick Nelson, Leroy Van Dyke, Billy Fury, Johnny Tillotson, the Searchers, Jody Miller, Chip Taylor, Jack Scott, Dorsey Burnette, Gene Vincent, Bobby Sherman and others. In 1965 Paul Hampton composed the theme tune for the NBC sitcom My Mother The Car. Between 1958 and 1993 Hampton appeared in 13 films, including the 1972 biographical drama of the life of Billie Holiday titled Lady Sings The Blues. The other co-writer of “Sea Of Heartbreak”, Hal David, was born in New York City in 1921 to Austrian Jewish immigrants. In the 1940’s David wrote songs for bandleaders Sammy Kaye and Guy Lombardo. He began working in the Brill Building in the late 50’s where he met Burt Bacharach. The duo became a force. They co-wrote “The Story Of My Life” which became a #1 hit for Michael Holliday in 1958 in the UK, and “Magic Moments” for Perry Como another #1 hit in the UK and #4 on the Billboard Hot 100 later that year. In 1961 Bacharach wrote “Tower Of Strength” for Gene McDaniels and “Baby It’s You” for The Shirelles. Bacharach and David had a banner year in 1962 with hits that included “(The Man Who Shot) Liberty Valance” (Gene Pitney), “Make It Easy On Yourself” (Jerry Butler), “Don’t Make Me Over” (Dionne Warwick) and “Only Love Can Break A Heart” (Gene Pitney). In 1963 the songwriting team enjoyed more accolades with “Wishing And Hoping” (Dusty Springfield), “Anyone Who Had A Heart” (Dionne Warwick) and “Blue On Blue” (Bobby Vinton). In 1970 they wrote a #1 hit for the Carpenters titled “(They Long To Be) Close To You”. . 1964 continued their winning ways with “Walk On By” (Dionne Warwick) and “There’s Always Something There To Remind Me” (Sandie Shaw, #1 UK). Other hits Hal David and Burt Bacharach co-wrote include “Do You Know The Way To San Jose”, “Raindrops Keep Falling On My Head”, “I Say A Little Prayer”, “This Guys In Love With You” and “One Less Bell To Answer”. The David-Bacharach team won Oscar nominations for “What’s New Pussycat?”, “Alfie”, and “The Look Of Love”. Separately, Hal David wrote “Broken Hearted Melody” for Sarah Vaughan in 1959. He died of a stroke at the age of 91 in 2012. “Sea Of Heartbreak” is a song using a simile of a man who is “like a lost ship adrift on a sea of heartbreak.” The fellow has no clue why the love of his life left him. His one preoccupation is to “sail back to shore, back to your arms once more.” He wants his ex to “rescue” him and take him away from the sea of heartbreak. We only know his side of the story in the lyrics. His ex-partner might be glad to be rid of him. Or, knowing how adrift he has become, the ex might decide their decision to leave was a mistake. In an article for Psychology Today, Dr. Susan Heitler writes that “rejection can be the start of building something better.” The old relationship (or marriage) needs to be put aside. It is important if there is any hope of salvaging the relationship to try to imagine a new one that works for you both. The first thing she suggests is to “get back on your feet.” This means that the guy in “Sea Of Heartbreak” can’t just plead to his ex “come to my rescue.” He needs to pull up his bootstraps and get his act together. Secondly, address your ex’s complaints. For the guy in “Sea Of Heartbreak” there must have been some behaviors that were a catalyst for his partner’s decision to leave him without any word of explanation. He has no idea why they left. Maybe they found it impossible to communicate, for example. If he wants to get back together he’ll have to sit through some possibly tough conversations and hear more about what wasn’t working from the other persons point of view. Once you’ve heard the tough stuff you have a choice to make to “clean up your act”, however that looks like. Finally, if there is hope for a new relationship, take time to name what you hope doesn’t happen if you get back together. Listing your “hope nots” can keep both parties honest about what they want to create and what they don’t want to create going forward. Finally, start things anew from positions of strength. Being needy and requiring the other person to “rescue” you won’t likely work very well in the long run, unless your ex likes to rescue romantic partners. “Sea Of Heartbreak” was featured in the soundtrack for the 1986 war film Heartbreak Ridge about the American invasion of Grenada in 1983; the 1993 crime drama A Perfect World starring Kevin Costner; 1997 film The Butcher Boy, and the 1998 crime-comedy film Clay Pigeons which starred Joaquin Phoenix. Gibson recorded a series of successful duets with Dottie West in the late 1960s and early 1970s, the most successful of which were the Number two country hit “Rings of Gold” (1969) and the top 10 hit “There’s a Story Goin’ Round” (1970). West and Gibson released an album together in 1969, titled Dottie and Don. Don Gibson also recorded several duets with Sue Thompson among these being the Top 40 hits, “I Think They Call It Love” (1972), “Good Old Fashioned Country Love” (1974) and “Oh, How Love Changes” (1975). A talented songwriter, Gibson was nicknamed The Sad Poet since most of his material concerned feelings of being alone and of love and regret. His composition, “I Can’t Stop Loving You,” has been recorded by over 700 artists. It was a #1 hit for Ray Charles in 1962. He also wrote and recorded “Sweet Dreams”, a song that would become a major 1963 crossover hit for Patsy Cline. Roy Orbison was a great fan of Gibson’s songwriting, and in 1967, he recorded an album of his songs simply titled Roy Orbison Sings Don Gibson. Gibson’s wide appeal was also shown in Neil Young’s recorded version of “Oh Lonesome Me” on his 1970 album After the Gold Rush.It is one of the few songs Young has recorded that he didn’t compose. With success came personal setbacks, however. Drug and alcohol problems plagued him, and he later said that he became hooked on speed when a doctor first prescribed it for his weight problem. Unknowingly, he wrote the song that would best describe himself and his career in 1960: “(I’d be) A Legend in My Time.” Eventually, he went back to Shelby, met Bobbi Patterson, who became his second wife and who was instrumental in turning his life around. They moved to Nashville where he devoted his life to songwriting, while continuing to record. In 1973 Don Gibson was inducted into the Nashville Songwriters Hall of Fame. He became a member of the Country Music Hall of Fame in 2001 and the North Carolina Music Hall of Fame in 2010. Following his death from natural causes on November 17, 2003, he was buried in the Sunset Cemetery in his hometown of Shelby, North Carolina. After he died the Don Gibson Theater opened on November 2009 in historic uptown Shelby. Originally constructed in 1939, the renovated art deco gem features an exhibit of the life and accomplishments of singer/songwriter Don Gibson, an intimate 400-seat music hall, and adjoining function space that can accommodate up to 275 people. One of the events that takes place each year at the Don Gibson Theater is the Don Gibson Singer Songwriter Contest, held over a weekend usually in the spring. During his career he released 34 studio albums and 4 “best of” collections. He had 22 hits in the Top Ten on the Billboard Country charts. But only one single, “Oh, Lonesome Me,” made the Top Ten on the Billboard Hot 100. In Vancouver, Don Gibson had four singles make the Top Ten. However, “Oh, Lonesome Me,” peaked at #37 in Vancouver. Don Gibson Biography, Country Music Hall of Fame.org. Don Gibson Biography, Alan Cackett.com. Tony Russell, Don Gibson: Singer-songwriter who was a pioneer of the Nashville Sound, The Guardian, London, UK, November 20, 2003. Don Gibson Theater, Shelby, North Carolina. Don Gibson Singer Songwriter Contest, Center For Creative Economy.com, January 2018. The Fabulous Forty, CKWX 1130 AM, Vancouver, BC, July 1, 1961. Susan Heitler Ph.D.”How To Get An Ex Back: 5 Essential Steps,” Psychology Today, May 25, 2012.